One with a properly formed sensus Catholicus, which Jorge Mario Bergoglio does not have, of course (see A New Sense for a New Faith, part one and A New Sense for a New Faith, part two), knows that the Catholic Church is the one and only true Church on the face of this earth. She alone has the mandate her Divine Founder, Invisible Head and Mystical Bridegroom, to teach, sanctify and govern in His Holy Name. All other religions are false. The simple truth that the Catholic Church alone is the true Church was taught in every parish throughout the world prior to the dawning of the age of conciliarism with the "election" of Angelo Roncalli/John XXIII on October 28, 1958, the Feast of Saints Simon and Jude, admitting that there were Modernists squirreled away in various parishes, seminaries, universities and schools and houses of religious formation who believed and taught, however guardedly, differently. One would have been very hard pressed during the first decade of my own life in the 1950s to find a Catholic who did not believe that the Catholic Church was the only true Church, although there were many Catholics, to be sure, influenced by the religious indifferentism that is part of the heresy of Americanism, who believed that Protestants and Jews would go to Heaven pretty easily. Today, of course, one would be hard-pressed to find Catholics in the structures of what most people think is the Catholic Church who believe that there is anything called a true church, no less that the Catholic Church is that one and only true Church, outside of which there is no salvation and without which there can be no true social order. Most Catholics today view those who do believe that Catholic Church is true Church are crazy, schismatic, judgmental and disloyal. "Saint John Paul II" and his successor, Joseph Ratzinger/Benedict XVI, each specialized in words and actions that gave succor to the adherents of false religions and even esteemed the symbols of such diabolical sects with their own priestly hands. Jorge Mario Bergoglio has, of course, capitalized on the destruction of the sensus fidei by his five predecessors in the conciliar "Petrine Ministry," throwing away any pretense of restraint to embrace any and every supposed clergyman with wanton abandon, including "high fives" to Protestant "ministers" and calling an Anglican evangelical "bishop," Tony Palmer, as his "brother bishop" in a seven minute video prepared for the "Kenneth Copeland Minstries" conference in Dallas, Texas, five months ago now (see Will “Coercionism” Accompany “Resignationism”?). This egregious apostate really does believe that Protestant "ministers" have a "mission" from Our Blessed Lord and Saviour Jesus Christ Himself to "spread the Gospel." The "gospel" that Jorge Mario Bergoglio professes, however, is one born of Modernism, a gospel that makes of Our Lord whatever the "believer" wants Him to be without worrying about minor little things such as "doctrines" or having the "message" "corrupted" by dogmatic councils, which just happened to have met, of course, under the infallible guidance and protection of the Third Person of the Most Blessed Trinity, God the Holy Ghost, and the "filter" of Scholastics such as the Angelic Doctor, Saint Thomas Aquinas. Moreover, Jorge Mario Bergoglio's "church" is akin to to Martin Luther's amorphous mass of "believers" who interpet the words of Holy Writ according to their own disordered "lights." In Jorge Mario Bergoglio's church, of course, everyone is saved, including Jews and Mohammedans and others who deny the Sacred Divinity of Our Blessed Lord and Saviour Jesus Christ, as what matters is the "heart," not doctrines and not a strict adherence to a "rigid" moralism. Everything that Jorge Mario Bergoglio believes has been condemned numerous times by our true popes, whether promulgating the decrees of Holy Mother Church's true general councils or teaching in their capacity as the Visible Head of the Catholic Church on earth. Those who do not see this by now have excuse before God for not accepting this as the truth. The evidence is clear. It is irrefutable. In a worldwide community of faith, the work and role of each Christian community matters. Given that 50 percent of those who call themselves Christian affiliate with Rome, when its spiritual and ethical authority is diminished it affects the entire world. When Rome loses her way, when corruption characterizes her financial dealings, when sexual scandals rob her of moral influence, when she fades from view in strongly declaring the nature and salvation of Christ, secularism rules. Pope Pius IX knew that he had the solemn Apostolic duty to seek with urgency the unconditional conversion of all men to the one, true Church. He told Protestants that their state "does not guarantee for them the security of salvation." He did not want to die to face a terrible judgment from Christ the King for not having done everything in his power to seek the conversion of non-Catholics to the true Faith. Jorge Mario Bergoglio does not believe he has any such solemn Apostolic duty. He is not a Catholic. Period. 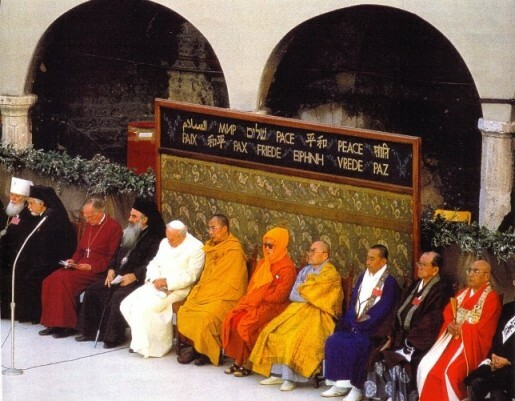 Jorge Mario Bergoglio's belief in "reconciled diversity" rejects such a "rigid dogmatism" even though it is part of the Sacred Deposit of Faith from which no one can dissent in the slightest withot falling from the Holy Faith in Its entirety. His belief in "reconciled diversity," recounted by Brian Stiller in his report for the "Global Evangelical Alliance," is orthodox heresy, that is, it is orthodox heretical doctrine in the counterfeit church of conciliarism. To further offend Our Blessed Lord and Saviour Jesus Christ and the Divine Constitution of His Holy Church, Jorge Mario Bergoglio will soon go to an "evangelical" "church" in Rome to "apologize" for the role played by the Catholic Church in "oppressing" Pentecostalist Protestants in the city whose true spiritual foundation rests upon Saint Peter, the first pope, and Saint Paul, both of whom served the Catholic Church, not some amorphous mass of believers. That is, a belief in American individualism and egalitarianism, each of which are false naturalistic principles having nothing to do with the Faith (the first individualist and egalitarian was Lucifer, after all), leads one down the path of the layman seeking equality in the sanctuary with the ordained priest, of the abolition of Communion rails, of standing for the reception of what purports to be Holy Communion, of the use of vulgar tongues, subject to all manner of change and misinterpretation and deconstruction and positivism, in the Sacred Liturgy, of the rejection of the magisterial authority of the Catholic Church as binding upon one’s conscience at all times and in all things. And the rejection of the magisterial authority of the Catholic Church leads one open to adopting Protestant Pentecostalism as the means by which one “knows” about God, deluding himself into thinking that God the Holy Ghost is leading him individually on a new path that deviates from the one prescribed by the Catholic Church. There is thus a direct path from Americanism to the “Catholic Charismatic Renewal” of conciliarism–in all of the other “movements” that have sprung up like weeds in the past forty-nine years since the close of the “Second” Vatican Council, and from that false council to Jorge's upcoming visit to a Pentecostalist church in Rome. Talk about "conversion in reverse." One will notice that the Calvinists, ever eager to make a buck--or the Dutch equivalent thereof, charged admission for the curious to see the martyrs, who would not renounce their belief in the Blessed Sacrament and in papal supremacy. It is that very truth of papal supremacy that Joseph Ratzinger/Benedict XVI is prepared to "discuss" with the heretical and schismatic Orthodox on the basis of The Ravenna Document. Today the Orthdox and tomorrow the descendants of the Dutch Calvinists and all other Protestants. 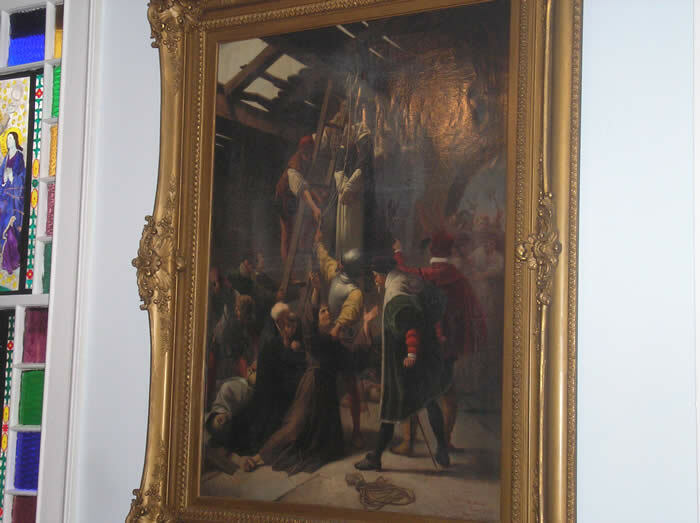 A painting of the Catholic martyrs of Gorkum, The Netherlands, who were tortured and executed in 1572 by Dutch Calvinists, the theological soul-mates of the "Pilgrims" who came to North America less than half a century later who were so "grateful" that they had had a bountiful harvest in a land where there was no Catholic Mass--or so they thought. (Our Lady of the Rosary Chapel, Monroe, Connecticut, the Feast of Saint Cecilia, Thursday, November 22, 2007; see L'Osservatore del Calvinista for a review of the benign treatment given John Calvin by L'Osservatore Romano. Has the counterfeit church of conciliarism and its "popes" and "bishops" kept the the true Faith or have they not contradicted it in stark, unmistakable terms as non-Catholics have been reaffirmed in their false religious sects and beliefs to the point of their very deaths? We must, therefore, bear the cross with joy and gratitude in this time of chastisement, recognizing that the errors of Modernity in the world and those of Modernism in the counterfeit church of conciliarism are intertwined with each other as but similar manifestations of the errors of Russia (see Conversion of Russia Update). We have much to suffer for our own sins. We must suffer well as we place not our trust in the princes of naturalism in this world or the princes of false "reconciliation" and "dialogue" with false religions in the counterfeit church of conciliarism. We must place our trust in the Immaculate Heart of Mary as we give this heart, out which the Most Sacred Heart of Jesus was formed, all of the sufferings of the present moment so that she can present whatever merit we earn from patiently and lovingly enduring them to the Throne of the Most Blessed Trinity. Saint Bonaventure, whose feast we celebrate today, July 14, 2014, was a firm defender of the Catholic Faith, a contemporary and friend and co-worker of Saint Thomas Aquinas. A son of Saint Francis of Assisi, Saint Bonaventure is, along with Saint Anthony of Padua, the seraphic saint's most brilliant followers, and one of the most profound defenders of the doctrine of the Most Holy Eucharist. Although exceptionally brilliant and one of Holy Mother Church's most gifted theologians and teachers, Saint Bonaventure was more than anything a champion of humility rooted in a deep love of the Most Blessed Trinity and of the Blessed Virgin Mary. And he was a master of the Scholasticism for which Joseph Ratzinger/Benedict XVI and his fellow "new theologians" have such profound contempt. May we, by imitating Saint Bonaventure's profound Eucharistic piety and tender devotion to Our Lady, storm Heaven by means of our Rosaries so that the darkness of the current crisis will pass sooner rather than later, conscious always of our need to make reparation to the Most Sacred Heart of Jesus through the Sorrowful and Immaculate Heart of Mary for our own many sins.